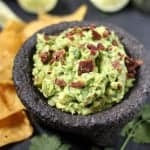 Smoked Bacon Guacamole with Smoked Tomatillos, is the ultimate guacamole recipe for smoked food lovers! It is going to forever change the way you enjoy your guacamole. Is there really anything better than guacamole? Think about that for a second. Guacamole is actually super simple to make. And in fact I have a super easy shortcut that has gotten me by for years. It’s perfect… or so I thought. There are some days I want to take my guacamole dip over the top and do something a little bit ambitious, like adding smoked bacon and smoked tomatillos. Are you with me? Oh yes. As if guac couldn’t get any better. Ladies and Gentleman, I’m about to tell you that if you were to take the time to smoke some bacon, and at the same time, smoke some tomatillos, then add those ingredients together with some avocados and a few other things, you’d have… well… smoked guacamole… or as I like to call it, magic in your mouth. Start by smoking your bacon and tomatillos. If you’ve been around a while, I don’t really need to tell you how to prep your bacon. We’ve been over how to smoke bacon with this recipe for Smoke Bloody Mary’s with Smoked Bacon & Smoked Strawberry Shortcake with Smoked Bacon Biscuits . But in case you’re wondering, just lay out a few pieces (4-5 because you’ll want to munch on one or two pieces as you’re prepping the guac) directly on your smoker, and cook for about an hour to 90 minutes, or until they are nice and crispy. As for your tomatillos, remove the outer husk, rinse them, and then put them in a glass bowl (or disposable tray) and place the bowl on your smoker up to three hours. Let the tomatillos cool. Then dice up the smoked tomatillos and crispy bacon, and add all your other ingredients, and you’re good to go. 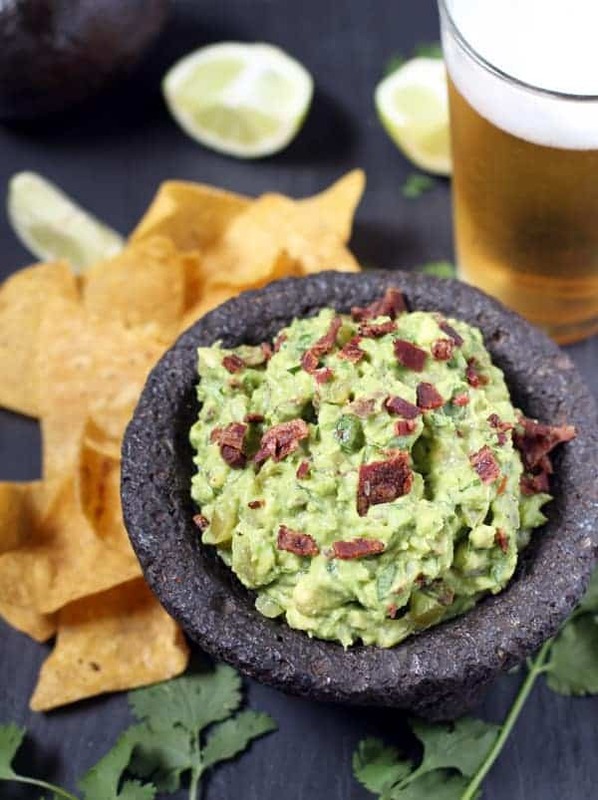 Recipe for Smoked Bacon and Tomatillo Guacamole. Take your guacamole to the next level by adding smoked bacon and smoked tomatillos! Smokey, creamy, delicious! Place bacon pieces directly on grill grate and smoke for 60-90 minutes or until crispy. At the same time smoke the tomatillos for three hours in a glass baking dish or disposable foil pan. Let cool, and then dice your tomatillos. 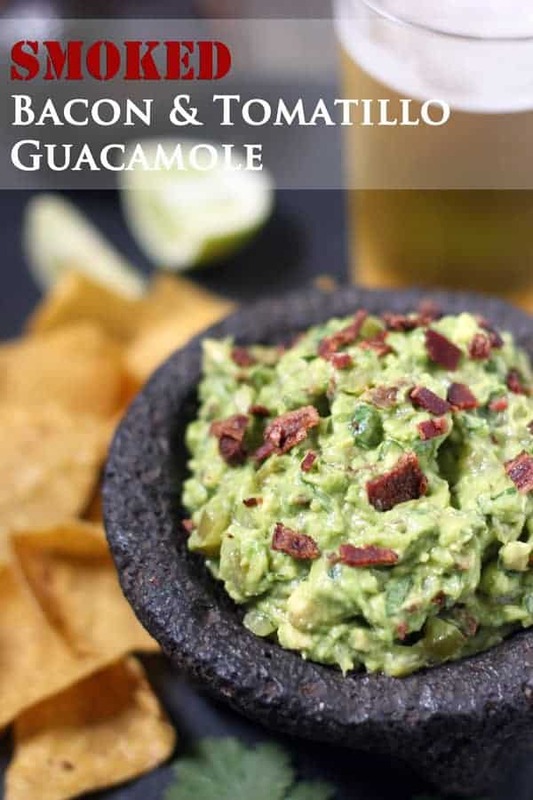 Use about ¼ cup of the diced tomatillos for the guacamole, and a total of 3 tablespoons of the diced smoked bacon. In a large bowl, scoop out the avocado. Add 2 tablespoons of the diced bacon, ¼ cup of the diced tomatillos, lime juice, shallots, cilantro, salt and pepper, and mash together with a fork until you reach your desired level of chunkiness. Adjust salt, pepper, lime juice to your taste preferences. Transfer to serving dish or bowl. Top with 1 additional tablespoon of diced smoked bacon. A secret shortcut if you don't have a smoker and don't feel like smoking your tomatillos. Use store-bought roasted tomatillo salsa (I love Whole Foods 365 Roasted Salsa Verde). Just use about 2 tablespoons, and instead of smoking your bacon, just use regular crispy bacon (I won't tell). It won't have the same magic kick as the smoked version, but it will still be damn good. I promise! I dare you not to eat the whole dish of smoked bacon guacamole with some crispy corn chips. 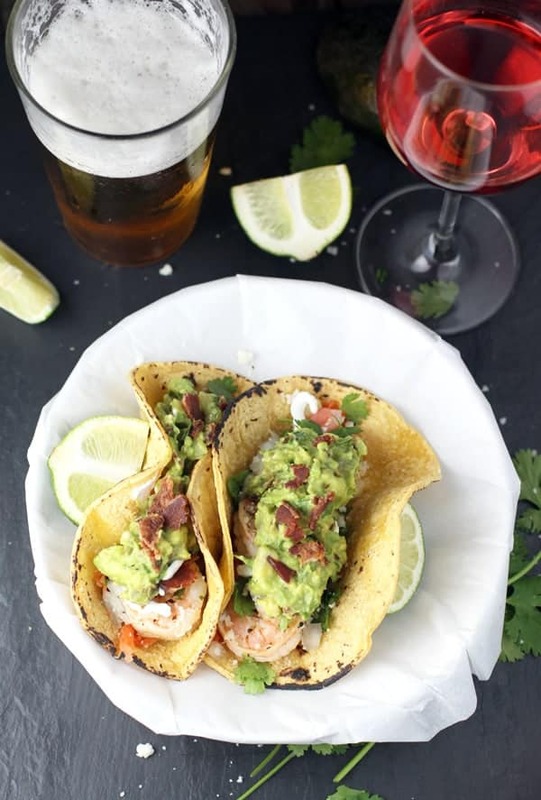 But if you have the self control to not eat it all before dinner, I highly recommend you top some Grilled Shrimp Tacos (using our Grilled Chipotle Shrimp) with it, like we did yesterday to celebrate our kids favorite day of the week – Taco Tuesday. This smokey guacamole recipe would also go great on top of our Carne Asada Tacos, or Chipotle Honey Chicken Tacos. Or if you are in the mood for a hamburger a big tablespoon of bacon guacamole on top is mmmmmmm- delish! Guac alone, the dish goes great with an acidic and herbal scented wine like Sauvignon Blanc or even Grüner Veltliner. 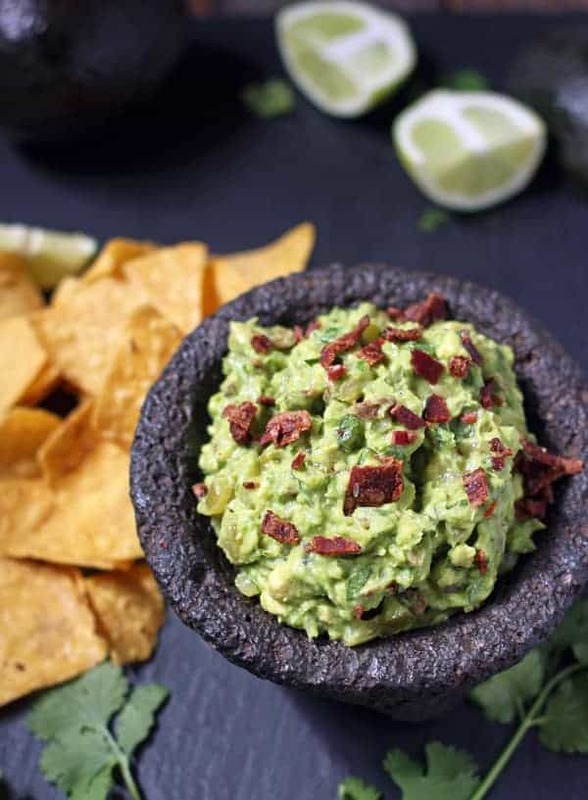 The herbal notes will compliment the cilantro and other flavors of the dip and the acidity will cut through the to-die-for creamy texture of the buttery avocados. Oh and don’t be afraid of the smoked bacon and tomatillos, the “smoked” flavor isn’t’ that strong. With the shrimp tacos, however, I like it with a fruity, crisp, dry rosé. Either way, go with a white wine (or rosé) with good acidity. Or drink with a Mexican beer like the hubs did. What’s your favorite beverage for creamy indulgent delicious guacamole?